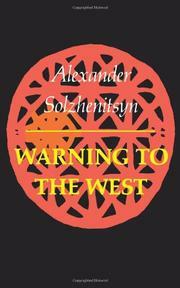 Probably not since Tolstoy have a writer's moral admonitions commanded the attention of Solzhenitsyn's. Warning to the West contains the texts of his three speeches in the US in the summer of 1975, the first after his expulsion from the Soviet Union--to the AFL-CIO in Washington and New York, and to the US Congress--and also transcripts of his celebrated BBC interview and radio address in March 1976. "Precisely because this is the worst possible time I have come to tell you about our experience over there," he tells his labor audience--firmly, tersely, inescapably.